How to Stop Procrastination and Old Limiting Patterns? Every step is a step towards something. Every moment we can choose to move closer to our dreams or play the same familiar melody that keeps us stuck in the past. While we may often be unaware of this, we still have the freedom to choose our reality with each passing moment. It may be challenging to turn a new page and create changes to our life, but the freedom is always there. I’m sure you’ve had the experience of using your personal power, taking action and not letting the old patterns control you. It has never turned out to be too difficult, has it? Sure there is a certain frustration barrier we must overcome before we take the first step, but when we look back on the experience, it has always been easier than it seems in the beginning. We only have to take one small step before the power of inertia takes over and gets us rolling. What goes in motion stays in motion until it’s stopped by another force – until we make a new decision. But understanding is one thing, and doing is another. I’m sure you all know this very well, because we have all experienced these powerful moments, but there are still times when it seems that we just can’t control ourselves. Why? In essence, we procrastinate because we link more pain to taking action than doing nothing at all. Sometimes we just don’t care. We say: “I don’t feel like it. Not now. Maybe tomorrow.” We just want to forget, slack off and receive pleasure by doing things we usually do under stress. We want to ground ourselves. Procrastination temporarily helps us to escape from our problems or emotions. But this satisfaction will never last. While it may be true that you seem to enjoy this procrastination, if you are really honest with yourself, you know it’s actually harmful and doesn’t lead you to long-term success. For me it usually happens when my energy levels are much lower than usual. I may be extremely productive and have fantastic results at one point, but suddenly something happens and my new self starts to shrink while the old self creeps in. Usually I have felt it after suppressing my true thoughts or feelings around people for a longer time. When I’m not acting like myself, stress and emptiness starts to spread in my body and I get a feeling of slowly losing myself. I may be conscious of this and observe everything what is happening, but my behavior is still being affected. Thanks to the strong awareness I don’t let it control me too much, but sometimes it can influence the following hours or days. From that point I have to build myself up and take that difficult first step again. I think it’s very important not to identify with this pattern and rationalize this behavior, because that would only keep us trapped. We better want to call this pattern a state of consciousness. It’s not you! Never let your thoughts take control of your ship and create unnecessary illusions that would increase the duration of this state of being. Always stay present and observe your thoughts! That’s the first big step towards a life of freedom and real choice. If we don’t get attached to our thoughts, we can also direct our emotional state and actions. I’m currently at the level where this state of consciousness doesn’t affect my views of life and I just observe myself in third person while I’m capable of doing some dumb things like procrastination, overeating, mindless online surfing or delaying my sleep, which are all bad for my health, but at least I’m aware of it and know that it’s just a temporary state. I don’t judge it nor believe in it. I just look at it like: “Hmm…” In that way there is no stress created and I can move forward much more easily. In the past I let myself be taken over for a long time, sometimes even for weeks, until I randomly managed to create a new state of consciousness again. Now I’m only “away” for a couple of hours maximum and this happens rarely. That’s good development! Learning to be a master of oneself may take some time, so be patient. The most important thing is not to let it cause panic in your life. There is no need to blame and judge yourself. There is also no need to lose faith and think that it’s going to go on forever like “Oh my god, this will never stop. I guess I will never change…” It’s bullcrap! I understand that we might experience some difficult feelings from time to time, but it’s important to let go of them and see them as temporary like clouds in the sky. Everything will pass eventually. The truth is, we can always start over. Every moment is a new beginning, so chill out and relax. Be loving and understanding to yourself and never give up. When we keep trying, there is always a possibility of fulfilling our goals, while giving up is a 100% chance of failure. Consistency creates miracles, so keep at it! Fall and rise again. In the course of time it will only get easier and easier. Although we may experience some really challenging situations in our lives, we can always choose how to react to these situations and that’s what ultimately determines our fate. Realize that you are in total control of your emotions, and happiness or motivation doesn’t come from the outside world. Admitting this the only way to actually be in control. The other part is using the right tools and tricks. Slow down and have some time alone. Interrupt your old patterns and become free of external influences. Eliminate distractions, turn off your computer or at least stop surfing. Be in silence. Change your focus. Move around and use your body. Reconnect with yourself and free your mind. Try to use different meditations techniques like observing your breath or listening to different sounds. Do this for a while to become more relaxed. This has always helped me personally, but if meditation is new for you, then you might need some practice with it. When you experience and become aware of the good effects of meditation, your confidence and certainty will grow and you will snap out of your bad habits more quickly. Avoid buying snacks, if you have a tendency to eat them while being distracted. Or try to eat your food before working on other things, because eating stimulates us and gives power to our bad habits. I can’t usually focus when I’m eating, because my mind switches to pleasure-seeking mode. It’s always easier to take action when food is out of the picture. When it’s necessary, hide it, but stop overeating at all costs! It’s not healthy and it doesn’t help you move forward with your life. When you find it difficult to stop mindless action, try to write about your feelings. Describe your experience, talk with yourself. You might get new insights and personal development. This has helped me countless of times, when I have felt stressed or under the control of my habits. Writing helps to come out of your head and observe what’s happening. That’s one step closer to freedom and using your personal power. Link pain to NOT taking action and pleasure to taking action. Be aware that getting started right now and coming out of the old loop is actually very rewarding and pleasurable. Remember your past experiences, when you’ve felt satisfied and alive. Doing what is important always pays off. Ask yourself: “Would I regret it?” This helps to stop your mind’s rationalizing and excuses. Think about the world and all the people, who are in need of your messages and actions. Be an example. Be the change you want to see in the world. Imagine changing lives and smiling faces. The power is in your hands and you can start creating a better world for yourself and others right now! Act now! After feeling a shift of energy, begin your work immediately. That’s the only way to change your emotional state for real. Don’t let the energy get wasted. You may feel positive and energized, but if you don’t take action, and instead ignore or forget your problems, that emptiness and dissatisfaction will return sooner or later. Make the task enjoyable and interesting. Put on your favorite music, which inspires and empowers you. Be clever and do whatever works for you. Focus more on starting than finishing. Take one small step at a time. Avoid multitasking and do just one thing. Decide to work on yourself and your goals for just 10 minutes. It’s a trick to motivate yourself to start. After that it’s easy to continue. When I first started writing my book after postponing it for a long time, I started with naming my Word document and writing my first sentence. I wrote about the desire to write a book. And oh boy, how did it all start flowing! Make plans and write down your necessary steps to success. Real decisions increase our confidence and certainty. When it’s written down, it’s real. Have a vision and keep your list of goals nearby. Ask for support! Have a partner to keep you motivated. My productivity levels increased tenfold, when I made a plan with a friend to put all of our daily activities into a shared Google Spreadsheet document. There we can see our completed or uncompleted tasks and pay close attention to each other. It really helps! Use public pressure. Declare your goals to your friends and give them the opportunity to see your progress as well. Put signs everywhere. Let everything necessary be in front of your face. Create a vision board or use inspiring backgrounds on your computer desktop. Use reminders. Wake up early and do the most important task first. It’s easy to start a new life in the quiet morning hours. Productive beginning creates a productive and happy day while oversleeping leeches our energy and motivation. I can’t stress enough how essential this is, because it totally changed my life. Find it out yourself and notice the difference! Love your work. Change your career or at least take small steps towards something new and meaningful so you’d have much more motivation to do the work. Find time to do the things you love and your passion will grow. It’s just a matter of time when you grow an opportunity to quit your job and earn a living by creating value to other people. Reconnect with your soul and your biggest dreams. Visualize. Imagine yourself moving closer to your goals thanks to taking action. Know that everything is possible. Believe in yourself and conquer the world! 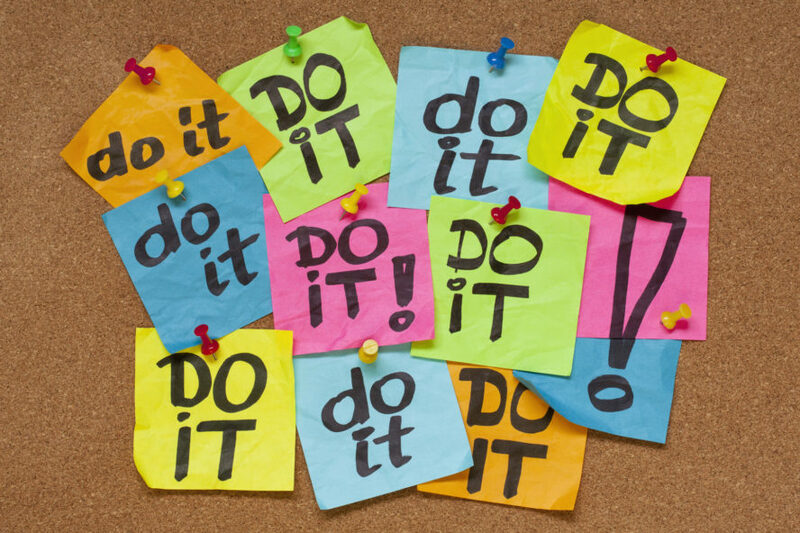 Procrastination is a common habit for all people, especially in our modern world. Just relax and know it’s totally understandable and okay. Take steps to overcome it, but when it happens, instead of being judgmental, just forgive yourself and let go of it. Patience is the key while practice makes perfect.